Today the Sessions Court at Limbang discharged not amounting to acquittal Encik Sia Tangi and three other accused, Mr Venson and Encik Jackson, Encik Sia’s sons and Encik Saging his son-in-law on three criminal charges. Two charges were made under section 436, a charge of mischief by fire with intent to destroy a house and one charge under section 435, a charge of mischief by fire or explosive substance with intent to cause damage to an amount of fifty ringgit. The charges under section 436 were that on 29.6.2011 in furtherance of the common intention of all, the four accused were charged of committing mischief by the destruction of two blocks of workers’ house and one block of staff quarters and to an office block by fire, owned by the main contractor Laras Jaya Construction Sdn Bhd, to a Water Treatment Plant project located at Long Kuton, Trusan, Lawas. Punishment under section 436 is a maximum imprisonment of 20 years. The charge under section 435 was that the on 29.6.2011 in furtherance of the common intention of all, the four accused were charged of committing mischief by the destruction of two excavators and three cement mixer by fire, where an estimated loss is about RM848,850-00. Punishment under section 435 is a maximum imprisonment of 7 years. The said Water Treatment Plant project once completed, is expected to solve the Lawas water woes that is getting more acute each passing day. Datuk Amar Awang Tengah had alleged Mr Sia Tangi recently in his winding-up speech in the last sitting of the DUN for being the person solely responsible for the delay of this project since it commenced works sometime in early 2011. But what was not disclosed to the public was that Sia Tangi appears to have been one of those who filed his claim for Native Customary Right (NCR) together with three others after notice was issued out under section 5 of the Sarawak Land Code. The questionable aspect of this case was that the District Office in Lawas had disbursed a total of RM473,625-35 to the other three claimants without Sia Tangi’s claim heard at all. Immediately Mr Sia Tangi filed an application in the High Court at Limbang and succeeded in obtaining an order to quash the decision of the District Officer to release the sum of RM473,625-35 to the other two claimants. As such, a proper hearing of all the claimants’ claims, including Sia Tangi’s should be heard by the Natiuve Court at Lawas. After writing to the Superintendent of Land and Surveys Limbang informing the Superintendent of the latest development and including the High Court’s order and to hear his claims of NCR which were never entertained, Sia Tangi and the three accused were charged for causing mischief by fire under section 435 and 436 of the Penal Code which carries a maximum imprisonment of 7 and 20 years respectively. In the course of the trial we found out that the said Project was given to Laras Jaya Construction Sdn Bhd without an open tender a project costing about RM64,993,900-00. We also found out that this company is related to those in power. We urge the Government to always be opened and transparent in giving out government contracts in order that others too may have the opportunity to prove their capability in doing such projects. Secondly, I wish to remind those in authority to discharge their duties justly and fairly in accordance with the rules and regulations and always giving the opportunity to a right to be heard. In our case, any reasonable person would suspect that there was something fishy about the release of the compensation monies to the other claimants. Those in authority must live above reproach. At the end of the day, the people at large will know all our deeds, bad or good. Remember what the Scripture says, “what we sow we will also reap” (Gal. 6:7). Ulu Niah (previous story) - Is it just that the courts are so often failing to protect the rights of poor local communities against the greedy land grabs of Taib's timber and plantation cronies? All human beings can understand justice. Where there is injustice it is up to our law-makers to legislate to prevent it and then for our courts to uphold those laws. But in Sarawak, where growing numbers of poor communities are being forced to desperate measures to save their lands and livelihoods, we often see the courts enabling the laws to work against the justice they were designed to uphold. 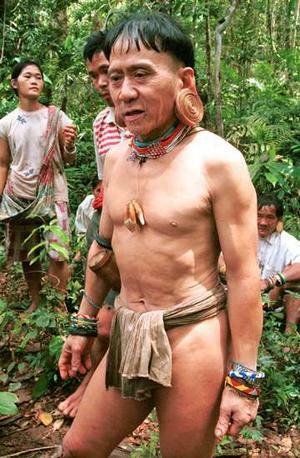 Take, for example, the recent crucial High Court ruling against a joint petition by Penan and Kelabit people in Limbang to save their forest lands from the greed of Taib’s timber and plantation cronies. The companies concerned represent some of the Chief Minister’s key business cronies, who have been happy to reward him and his family with huge payouts, shares and hefty subsidies at election time to help him bribe the small number of people in Sarawak that he has risked entitling to vote. For example, Ravenscourt Sdn Bhd is owned by the billionaire Yaw family of the timber giant, Samling Global (who have handed a tenth of their company shares to Taib’s cousin Hamed Sepawi and to his Bomoh, Ahmad Suut), while Billion Venture Sdn Bhd, belongs to another of Taib’s wealthy cronies, the Hii family. 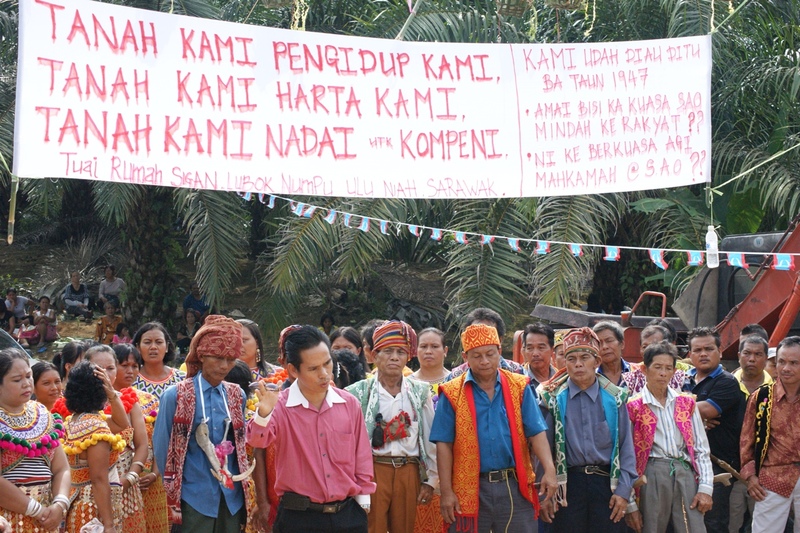 The communities, represented by the Native rights lawyer and PKR State Assembly member See Chee How, made the valid complaint that their lands had been cut down and destroyed by Samling and then planted with oil palm by the Hiis. The timber licence had been handed out by Taib’s government as early as 1984, while the plantation licences had been issued in 2004 and then another in 2010. “Entered, encroached and trespassed into their NCR lands to cut and harvest timbers and to maintain planted forests for merchantable timbers”. It comes as little surprise that the billionaire businessmen had not even compensated the poor people for this destruction and disturbance. Indeed, such rights are not only enshrined in Sarawak’s Native Customary Laws, but in the United Nations Declaration on the Rights of Indigenous Peoples, to which Malaysia is a signatory. However, the judge in this case identified a major ‘flaw’ in the plaintiff’s arguments. A case, which Samling, Billion Venture and their co-defendants in the State Government had already chosen to describe as “scandalous, frivolous and vexatious” ! Did't you know to find yourself a lawyer? 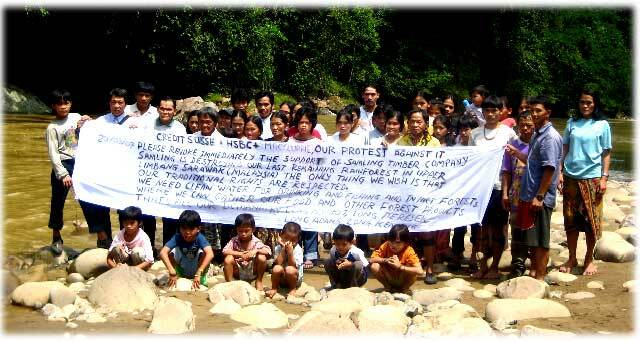 Surely, it is the duty of the government to assist and inform indigenous peoples when their lands are being encroached! The judge pointed out that the natives of Limbang had failed to file their legal complaint within the 36 month period allowed under the law. He defined that period as having begun from the moment Taib’s Forestry and Land & Survey Departments had issued the licences to their pet business-partners and political supporters. Now everyone knows that in Sarawak such licences are far from publicised or held up for tender! To the contrary they are handed out secretively and in return for kickbacks and shares for Taib family members. So, we ask how were the locals in the distant forests of Limbang to know these licences had been issued to log and plant their native lands? Often such licences are carefully sat on for years by the canny recipients for this very reason. By the time they turn up causing trouble on the land the period for complaint will have expired! So, how can this ruling represent justice? In any genuinely democratic country there would be a strict obligation on the body issuing the licence (in this case the State Government of Sarawak and the Forestry Department) to consult and notify the local people well in ADVANCE of any timber or plantation licences being issued. We don't regard this as a legitimate form of protest - you need to hire an expensive lawyer and launch a proper civil action against the billion dollar logging companies before we can recognise the villagers' complaints! Failure to do so amounts to mere trickery and fraud. How are the barefoot people of Sarawak’s jungle supposed to check each day in the Forest Department of Kuching as to whether a licence may have suddenly been issued on their native lands? but he opines that they should have at least taken action once they became aware that people were logging in their jungle and trespassing their lands. Clearly, the waves of blockades, brutally suppressed by the police, did not constitute the form of complaint and action that the judge had in mind in this respect. Because there were of course very many such complaints. So, did he instead expect the barefoot natives back in the 1980s to have summoned up a 4 -wheel drive or helicopter and made it out to Kuching to hire lawyers and launch a civil case against the logging companies? Dressed for a trip to town? 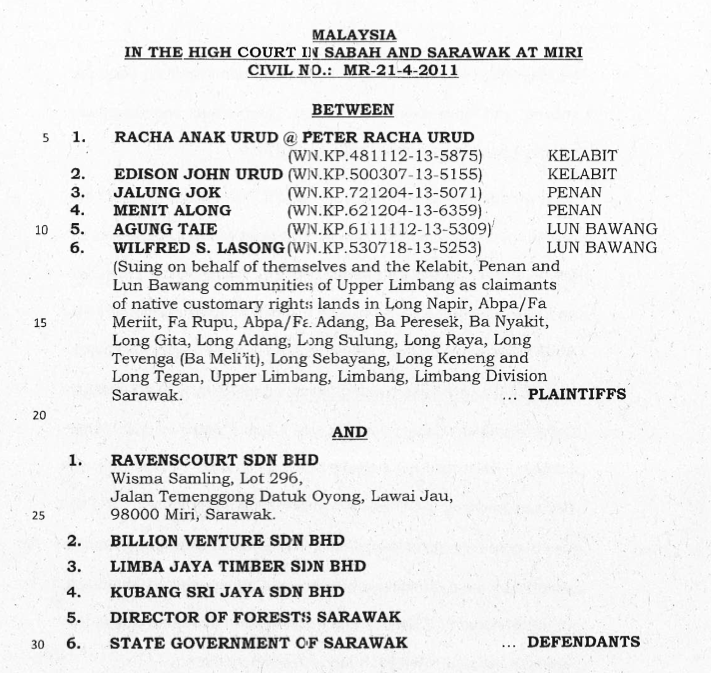 How were the Penan to set about hiring lawyers to fight their case against Samling back in 1985? Yet, these people had no money and no education. They had never heard of lawyers, let alone being in a position to pay them. They lived a different life and it for this reason the UN passed the Declaration to defend their rights against exploitation by people like Taib’s loggers. The very minimum duty of the State of Sarawak under such circumstances would have been for officials to have gone to visit and consult them and to offer these peoples the means to defend themselves through free legal advice. At the very least the option of compensation should have been offered. However, the greedy Chief Minister (law alumni and honorary doctor of Adelaide University, Australia) and his henchmen failed on each and every count. These plunderers destroyed this precious habitat and left these communities to survive on what little left they could find to eat. And now, instead of penalising Taib for this naked exploitation, judges are still willing to stick to the letter of the law, while ignoring every count of natural justice. At last the people of the interior have woken up to the actions they need to take when faced by predators armed with suspect licenses. Native Rights lawyers have come to their rescue and are providing the advice they so badly needed and were deprived of back in the 1980s and 1990s and even recently. So, it is time the judges of the Malaysian court system start voicing disapproval at the litany of corruption, fraud and theft by Sarawak’s rulers against their people. 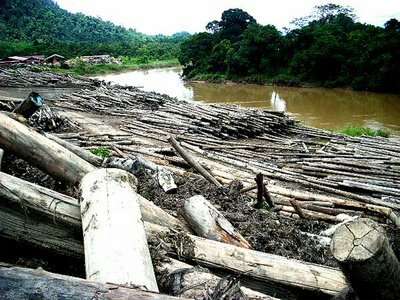 Billions have been made from the sale of Sarawak’s timber and billions more from the plantation of Native Customary Lands. Those billions have gone to Taib’s license-holding friends and to his own family members, like Ta Ann’s Hamed Sepawi, who has received tens of thousands of hectares of ‘alienated’ lands out of the state’s land bank. Also, Taib’s own son, Abu Bekir, whose company Titanium Management has been handed vast plantation areas as well. The time must come very soon when this outrageous injustice is recognised and it must be put right. 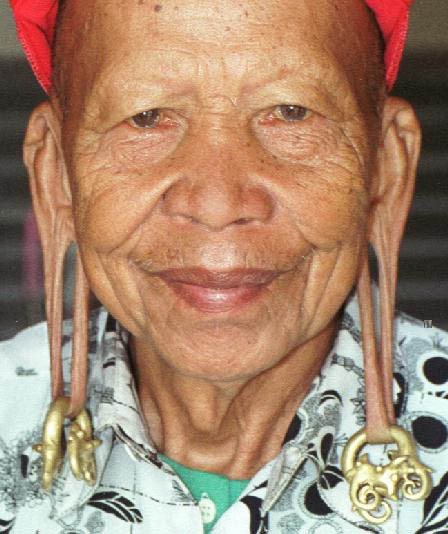 The natives of Sarawak deserve to benefit from at least some of the profit from their lands. They should enjoy at least some of the comforts that money can buy in return for the destruction of their culture and their habitat. It is time the courts started exacting some fines from the likes of Samling and Billion Venture and those fines should be very heavy ones indeed. PETALING JAYA, June 29 — New criminal charges against Datuk Shamsubahrin Ismail accuse him of convincing Datuk Seri Mohamad Salleh Ismail to hand over RM1 million to bribe police investigating graft claims against the National Feedlot Corporation (NFCorp), the consultant’s lawyer said today. N. Surendran told a press conference today public prosecutors should also charge NFCorp chairman Salleh, who is the husband of Datuk Seri Shahrizat Abdul Jalil, for trying to bribe the police to close the case. “The Attorney General is admitting in the charge sheet that Salleh was trying to bribe police. I have never seen such a charge from the AG’s chambers as it goes against public policy,” said Surendran (picture), who is also a PKR vice president. The purported charge sheet dated June 12 made available to reporters shows that an initial charge of cheating Salleh, who with his three children own the company accused of abusing a RM250 million federal loan, was split into four different parts. Shahrizat has been dogged by allegations of corruption in the RM250 million federally-funded cattle farming project awarded to NFCorp, a firm owned and operated by her husband Salleh and three children, when she was still a member of Cabinet. NFCorp has been accused of using the RM250 million loan to finance over RM60 million in assets and expenses unrelated to the cattle farming project it was tasked with carrying out, most of it via other companies owned by Shahrizat’s family. The Wanita Umno chief even had to take three weeks’ leave from her ministerial duties to allow the authorities to investigate claims of abuse and power against both her and her family. The scandal, which has been dominating media headlines since last year, later led to Shahrizat’s stepping down as minister after her senatorship expired on April 8. Before stepping down, her husband Mohamad Salleh was charged with criminal breach of trust and violating the Companies Act in relation to RM49 million in federal funds given to NFCorp last March 12. But the Malaysian Anti-Corruption Commission (MACC) said last month Shahrizat was not involved in any wrongdoing related to the award of the project to NFCorp. Supposed NFCorp consultant Shamsubahrin was also charged with 17 counts of money laundering on June 18, worth a total of RM4.1 million. Slow death by aluminum smelters? UN reprimand for M'sia over Taib?